The other day I was feeling super adventurous and decided to try a medium that’s new for me- clay. What resulted was: one ruined manicure, two stabbed fingers and three beautiful clay dishes. The good news is, now I know what works and doesn’t work so you can save yourself a few bandaids. Here ya go! 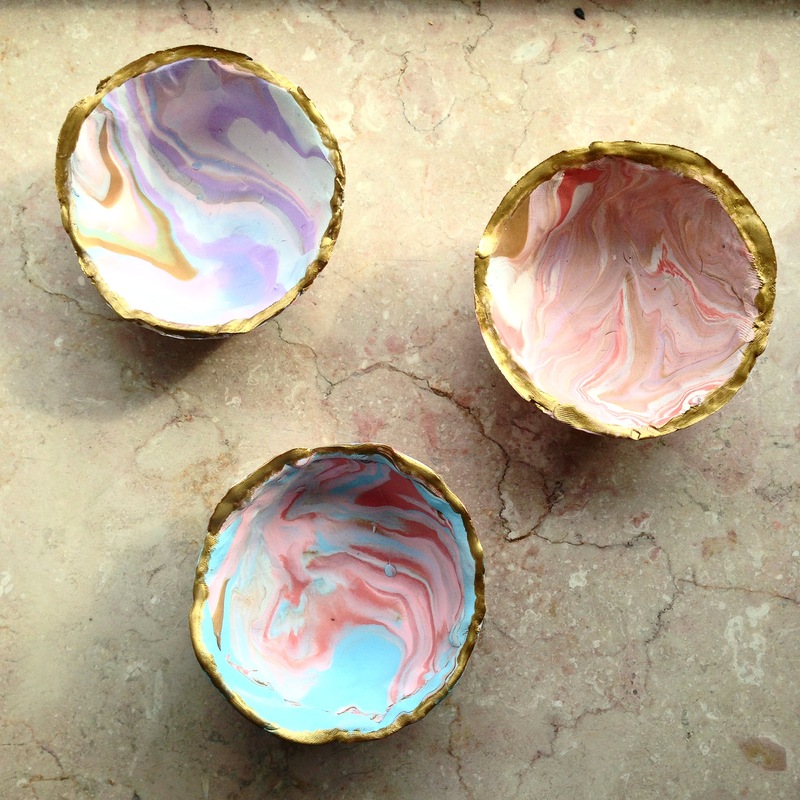 A Marbleized Clay Dish DIY!! -Three oven-safe bowls. Their base should be the size you want your dishes to be. These are your molds. -Oven-bake clay. I bought a jumbo size of white, and several accent colors. –A clay knife An exacto knife. As I will explain later, clay knives are terrible. -A container with a circumference wider than the base of the three glass bowls (I only used it for two of the three dishes). STEP 1: Lay wax paper onto your workspace and tape down the sides so it can’t slide around. 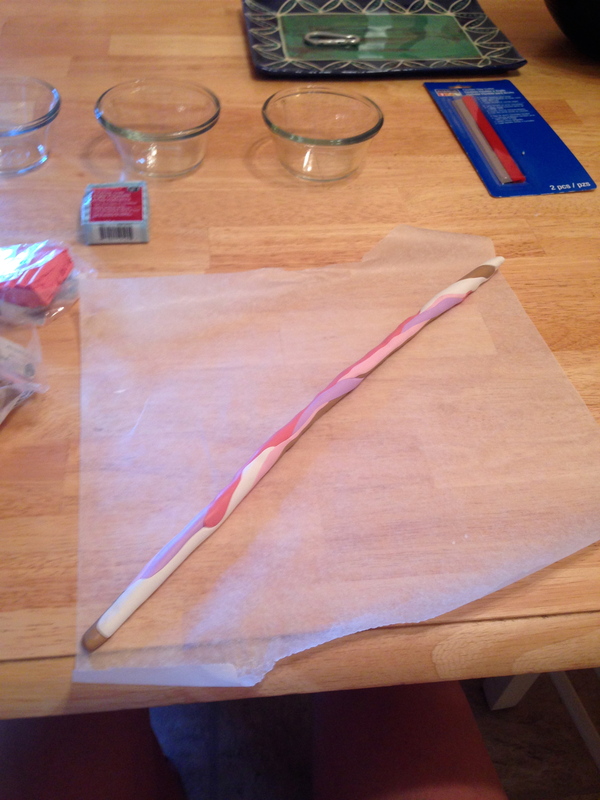 Then, break off a chunk of white clay and roll it into a snake that is roughly five inches long, and a couple centimeters wide. 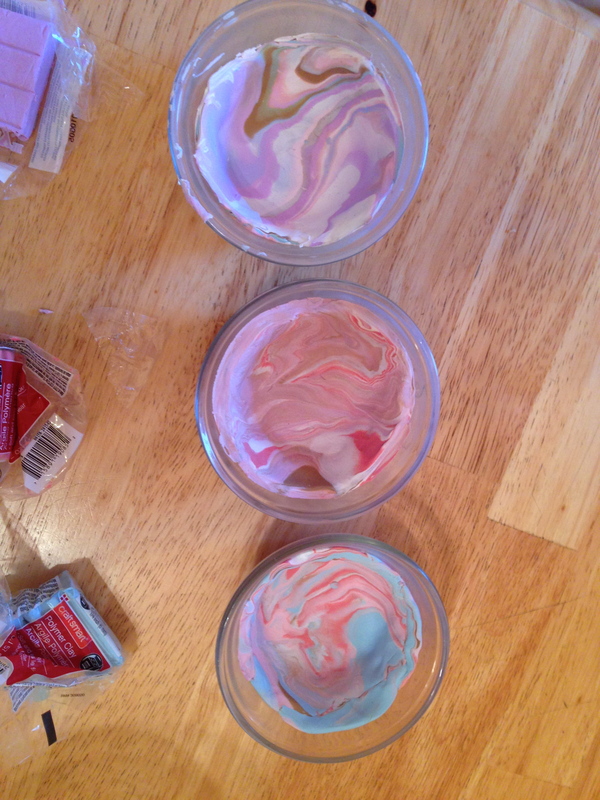 STEP 2: Break off slightly smaller sections of the other colors and roll them into snakes. These can vary in length and width. 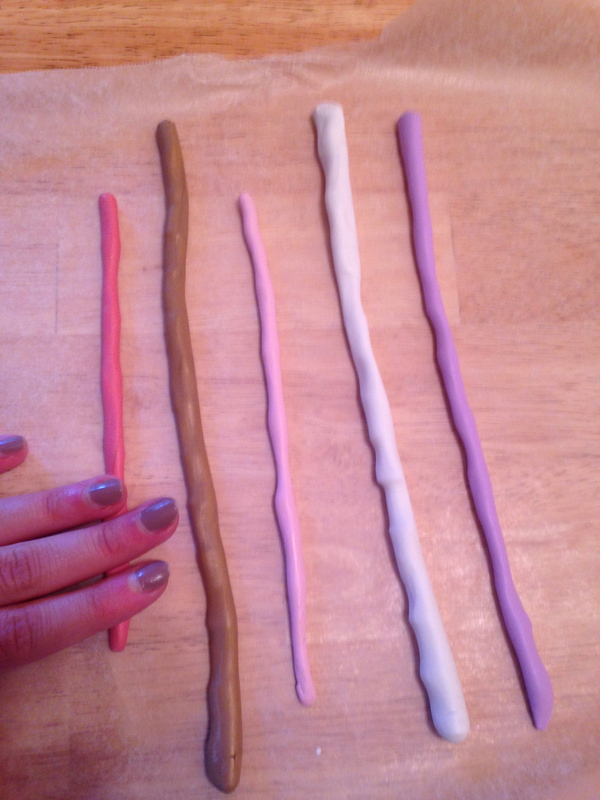 As you make more of these dishes, you will learn what ratios of clay work best and look best. Also, you can always add more clay later. 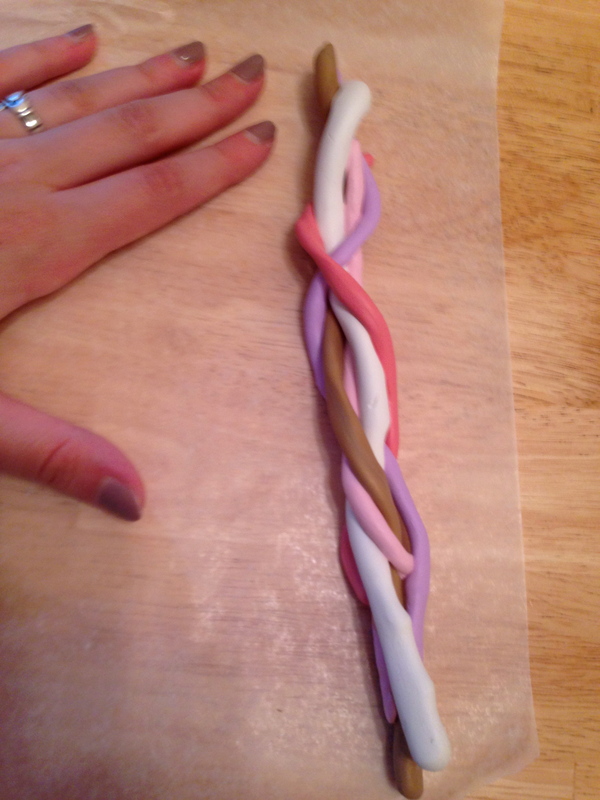 STEP 3: Twist the snakes of clay together, wrapping them around each other more and more tightly until they appear completely interwoven. STEP 4: Smush the jumbo snake together and roll it into a ball. 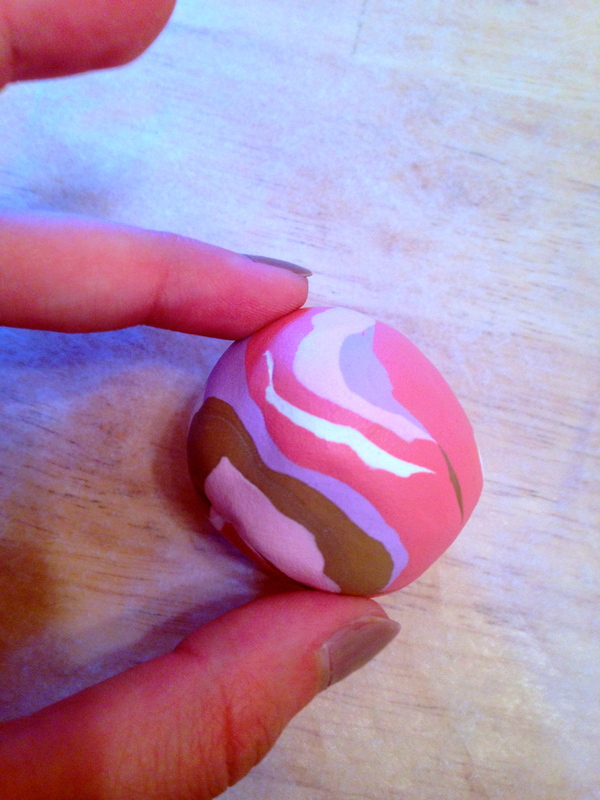 If only a couple of the colors are visible on the surface, stretch it back out and roll it into a ball again. STEP 5: Use a rolling pin/water bottle to flatten the ball. Keep rolling until the circumference of the clay is wider than the circumference of your round container. STEP 6: Place the round container on top of the flattened clay, and trace around it with your clay knife, to cut off the excess clay. 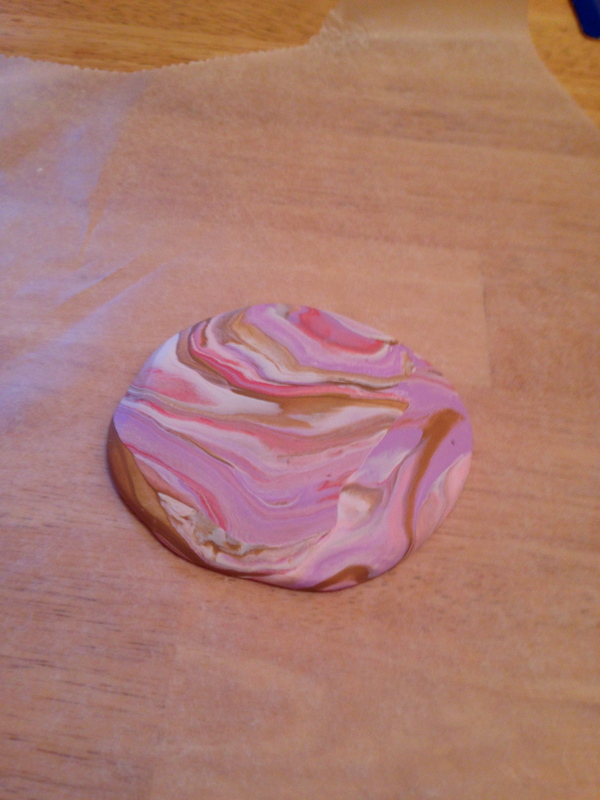 You should be left with a perfect circle of marbleized clay. However, my clay knife was a horizontal blade, and did not cut very well around a circle. 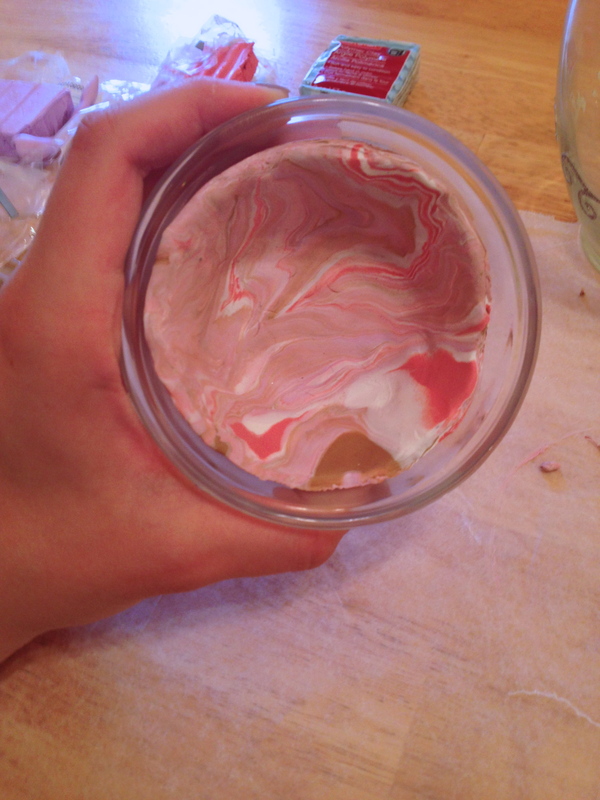 Instead, it cut my fingers and created a very jagged edges on the circumference of the clay. 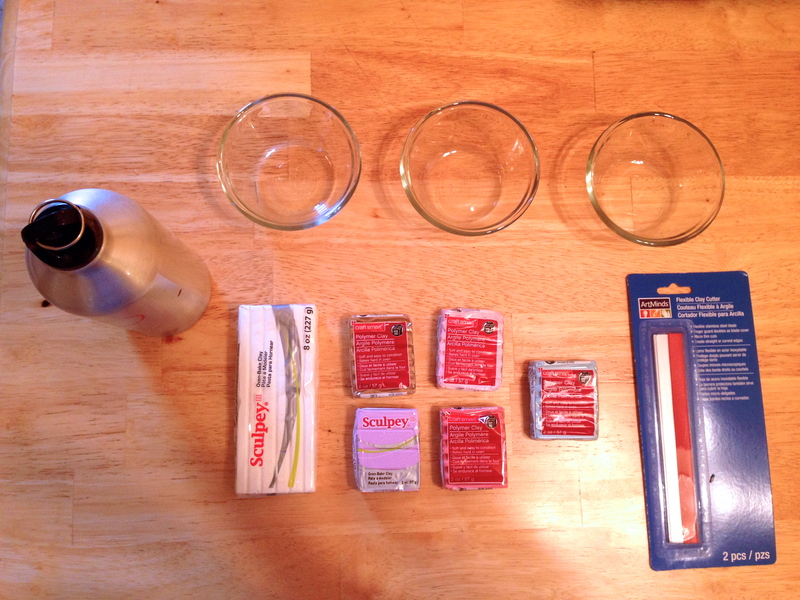 If you have an exacto knife, this method will probably work a lot better. STEP 7: Finagle your circle of clay into one of the smaller bowls. It will be a little difficult, because it will be wider. 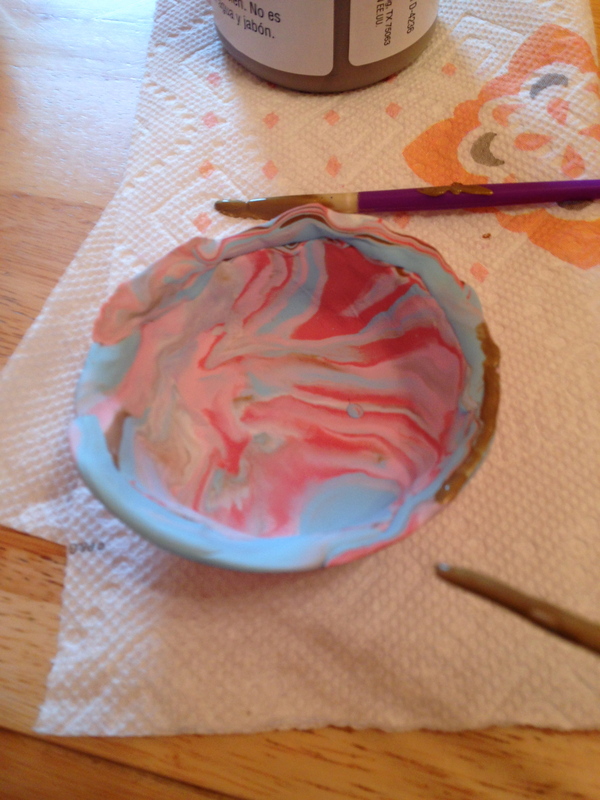 You may have to use your knuckles to press the clay into the sides of the bowl and get rid of air bubbles. 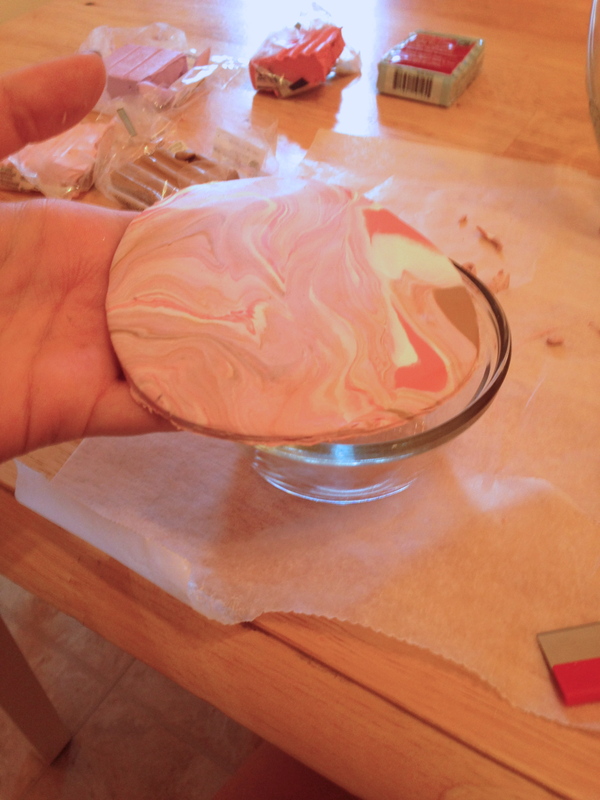 Allow the clay to fold up on the sides of the dish, creating a dish shape in the clay. If you’re feeling super inventive, or have a really bad knife like I did, you could also forgo tracing around the round container entirely. What I did for one of my dishes was 5)Roll the ball of clay into a patty using the water bottle 6)Press the misshapen patty into one of the glass bowls to create a dish shape 7)Cut down excess clay using the clay knife once the clay was inside the dish, checking to make sure it was level by holding it in front of me and rotating it. STEP 7: Once you have made several bowls, with either method, pre-heat the oven to whatever temperature your clay indicates. Mine was 15 minutes at 275 degrees. Once the oven reaches that temperature, place your dishes inside and let them bake. STEP 8: Let them cool! I waited around 15 minutes for this. Then, turn them upside-down and lightly tap until the dishes fall out of the glass bowls. This could take a while. I let one of mine sit upside for an hour before it dropped on its own. 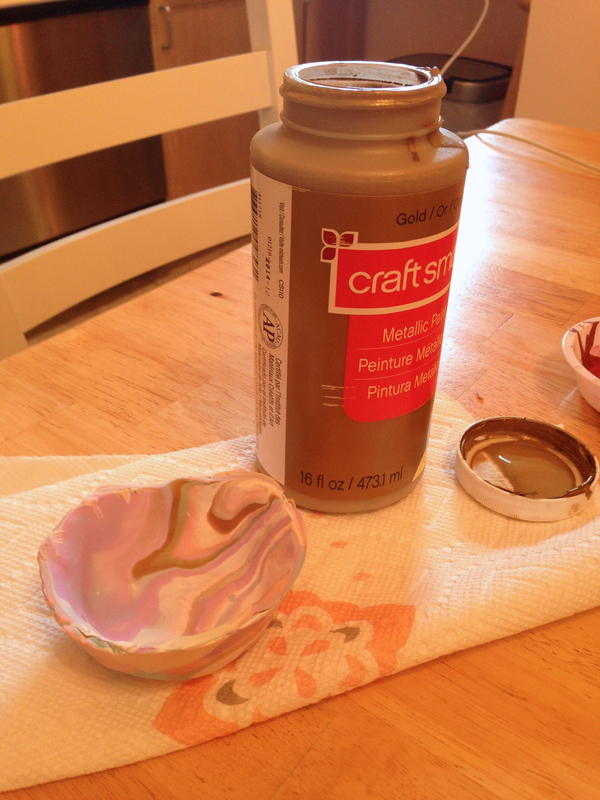 STEP 9: Use a thin paintbrush and gold acrylic paint to paint the rims of the bowls. 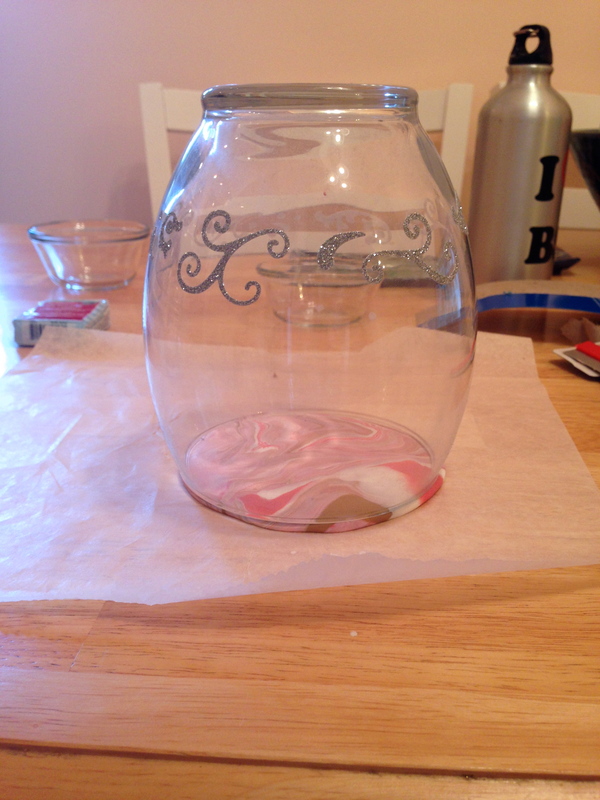 STEP 10: Let dry! You can coat the final dishes with a glaze if you like. Want to receive crumpets in your mailbox? Subscribe to my newsletter!